Chew is one of those books that everyone should be reading. It’s original and very tongue in cheek. It’s a mixture of Mad magazine, buddy cop movies, and alternate universes. It provides political commentary without any of the seriousness. The artwork is wonderful. It takes huge chances and it pays off. It’s another reason that Image Comics remains successful and cutting edge. This trade picks up after the FDA assault on the Collector. Many FDA agents were killed or seriously injured including Director Applebee and Tony Chu’s daughter Olive. The FDA is in shambles. Many of the agents are being reassigned new partners. Tony Chu refuses to work with his old partner, John Colby, so he is partnered up with informant, Deshawn “D-Bear” Berry.” Chu’s first partner in the FDA, Mason Savoy, is also injured and recovering in the same hospital as Olive and the other FDA agents. Suddenly, Savoy, Olive and Chu’s wife Amelia Mintz have disappeared. Chu assumes that Savoy has kidnapped them but then learns through his powers that they are working together to take the fight to the Collector. My favorite part about the Chew series is the humor. If there was no overall plot, I would still enjoy this book. In each panel Rob Guillory throws in signs with hilarious statements. I could spend hours finding each one. D-Bear is definitely a throwback to Huggy Bear of “Starsky and Hutch.” Ironically, he takes to being a FDA agent quickly and helps close some cases. Despite the humor, the writing is really good. It’s edgy and different and John Layman moves the story along at a decent pace. Layman’s universe is amazing. All of the powers are based on eating food which can either be hideously disgusting or tasty depending on the reader. In this trade, Layman introduces a slew of characters with different powers. Some of them even confused the agents of the FDA. Although Poyo, the psycho chicken is dead, its influence is still felt especially at the end. I enjoy the tension between Chu and the members of his family who usually can’t stand him. In this trade, we see Chu finally snap and take matters into his own hands. To be honest, I can’t picture anyone doing the art for Chew outside of Rob Guillory (who everyone should follow on twitter). Guillory’s artwork is detailed and follows the story well in the panel. Guillory puts globs of humor into each panel. His attention to detail is unparalleled. He does a great job creating Layman’s universe. When he draws some of the terrible food Chu has to eat to figure out a gas, the reader will gag. 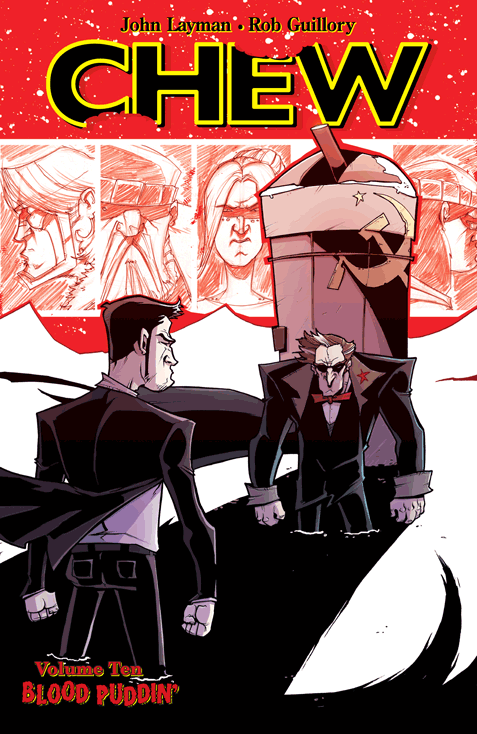 I have been reading Chew since the first issue and it’s a comic that I thoroughly enjoy. It definitely stands out and I can safely say there is nothing out there like it. Chew represents the number one reason many of us read comics: to escape. It’s just good to sit down and open up an issue of Chew to go to a place that makes absolutely no sense. It also provides me a slew of jokes to use on foodies and hipsters.